May I call you Linda? 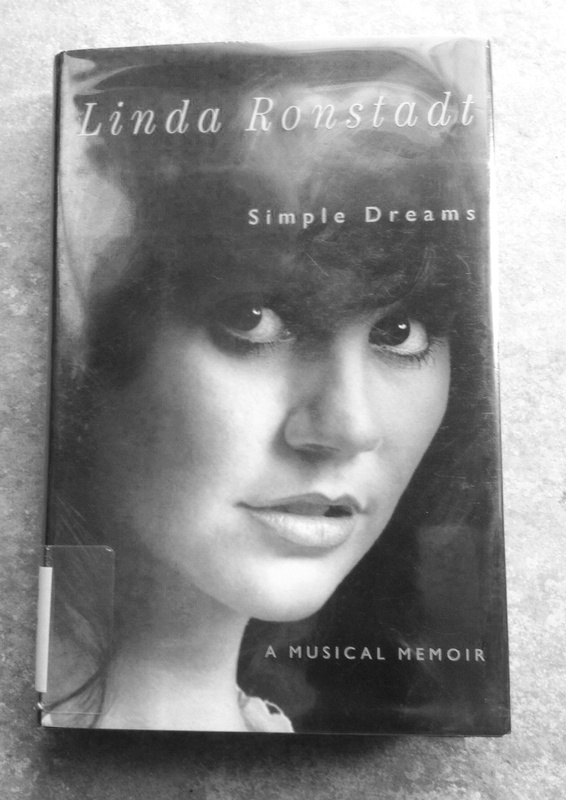 I thought I knew you well enough to call you Linda until I read your memoir Simple Dreams. I fell in love with you in the late 60’s when your Stone Poneys’ folk-rock song “Different Drum” hit the charts. Oh, how I wanted to be like you in that song: emotionally strong, independent, not needing a guy, forging my own path unencumbered by someone else’s expectations. I followed you through the 70’s as your wide-ranging, crystal clear voice and rock music repertoire earned you status as one of the few solo “girl singers” on the male-dominated concert circuit. I wanted to be the “you” captured in photos wearing that simple white peasant blouse and those up-to-here cutoff jeans, your shapely legs curving down into a pair of well-worn cowgirl boots. I wanted to be the “you” who shared the stage with Emmy Lou Harris, belted out duets with Neil Young, and partied with Don Henley and Jackson Browne. You were everything I wasn’t – me stuck in white bread Midwest America where a glamorous singing career, star-studded parties and a seemingly wanderlust path were about as attainable as a trip to the moon. All this time I thought I knew you, and I envied you. You set me straight in Simple Dreams about life on the road and my false impressions about the ease of your rock star career. Your “party” image and bad girl attitude were promoted by your manager to shape your public persona into one fitting the rock milieu. For the most part, that image didn’t reflect you or your rich Mexican heritage and close family ties. Your life on the road was often lonely because breaking into the rock industry as a female lead singer came with its own stressors, many the result of male band ego issues. From short-short cutoffs to pirate pinafores to elegant ball gowns, your crystal clear voice has filled my home with music straight from your heart. Linda Ronstadt was inducted into the Rock and Roll Hall of Fame on April 10, 2014. Sadly, she has been diagnosed with Parkinson’s disease silencing one of the most gifted singing voices of our time. Her book was very well written (unlike some autobiogs). Yes, it’s very sad about her disease. She lives in San Francisco and doesn’t travel much, but seems mostly upbeat in interviews. She is still a real beauty, but it has to be a difficult disease to cope with. I just love her voice, no matter what type of music she was singing. Linda Ronstadt was one of my favourites .. Blue Bayou …. thank you Sammy, will listen to her later. Too sad about the Parkinsons .. hopefully she is getting good treatment for it. Thank you, Susan! I can’t pick a favorite because every one I hear is my favorite till I hear the next one 🙂 I like “When Will I Be Loved” plus her duets with Aaron Nevile. Blue Bayou is also great. We listened to all her music on a recent road trip to Texas. Terrific homage! I recall being blown away when I saw a recorded performance of “Pirates of Penzance.” Thank you for this. Thanks, Maggie. And I’ve never seen it! I don’t know why I let that one slip by. As I wrote this, I knew I’ve got to track it down if it’s on DVD. Hi Kirsten – I’ve become hooked on coming of age stories of my (your?) Boomer artists, musicians, athletes – as you say, there is so much we didn’t know at the time. And I am enjoying their perspective as they age and look back at the 60s and 70s. Nicely done. She’s always been a favorite of mine as well. Great book synopsis, and lovely to have the photos to go with it. Thanks, Tina! Have several other Boomer icons I’m reading about, so more posts to come. Not book reviews, just reflections…. When we think our lives are out of control, imagine what it must be like having managers, public, and band trying to pull you in all different directions as well. The cost of fame is dear. Linda Ronstadt’s Blue Bayou album was the second record I ever owned (the first was one by Olivia Newton-John). I practically played that thing ’till it bled. But her experience goes to show that that life wasn’t always easy. Glad she was able to finally find her own peace in the music industry. Thank you, Lynn. I wish I had seen her live, and am glad you had that experience. There are quite a few recent interviews with her if you google her. She doesn’t travel, but seems very happy in her home in San Francisco. The book was very well written – I especially enjoyed her background about her growing up years in Tucson; I got it at my library. I can’t say I know anything about her, but Parkinsons is a horrible disease to get, my S-i-L has it and I remember one of my aunts had it too. One of those debilitating illnesses we all hope we don’t get. You are right, Jude. It robs one of so many abilities and not nearly enough advances in treating or preventing it. It is only a matter of time before we conquer some of these, but not in time for current sufferers. Hey TR – thanks for visiting! You would enjoy her memoir. The first part, she talks extensively about growing up in Tucson where her grandfather had a hardware store, and many ties to ranchers in northern Mexico. Her whole family was very musical. See if your library has the book. Wow, great post! I may have to read that book. My mom had an *8-track* of her music that we used to listen to in the car when I was a kid. I love her voice, too. So sad about the Parkinsons 😦 thanks for posting this ! Thanks for reading! I don’t think she used a ghost writer, and the book is well organized and written (unlike a couple other celebrity authors who could have used some help!) I got the book at the library, so I’m sure you can find it, too. Thank you, Paula. Yes, I am sure it was hard for you to read that part. That particular song holds such meaning for me. I pray for her family and yours. when I was in college I carried a photo of Linda in my wallet. She was wearing overalls and had a cute page boy haircut! I wanted to be her! You must have really liked her to carry a photo. So sweet, our teen crushes. I remember Linda, she made Jerry Brown cool. And I loved that dipped into the genre of Nelson Riddle. Didn’t know about the Parkinson’s. I see Jerry Brown is again Governor of California. Yes, that was an interesting matchup – she speaks fondly of Jerry in the book. Good to know, they were cute together and yeah, interesting..
Great post. I think I’m at two degrees of separation because although I’ve never met her, she used to date (former and now again) Governor Jerry Brown of CA, who I have met, and she was also a neighbor of my dad’s. I confess, Blue Bayou was never one of my favorites (not even close), but I could play her Greatest Hits over and over and over (and I did, on my eight-track, back in the day), and even now, every time I hear one of her duets with Aaron Neville I get goose bumps. Such a versatile performer, and always such a beauty. You sweetheart! I rarely read other comments first before I write my response, and hope you don’t start! I want YOUR reactions and thoughts without being influenced by what others already said. Definitely two degrees! It was an interesting match with Gov Brown, eh? I think her duets with Aaron are some of the best, too! Thanks, Melinda. Such a lovely lady– and this is what pisses me off, why should beautiful people, inside and out, have to bear with the indignity of debilitating disease? They are insidious diseases that hit – as you say – indiscriminantly. Disease, debilitating injuries and death cannot be explained in terms like fairness or reason. I don’t know how people have the courage and willpower to face such challenges. I try to learn to live my life more fully because they are willing to face theirs. I adored Linda Ronstadt, and still listen to her. It broke my heart when she stopped singing, for her. I can imagine. She was a neighbor in Malibu and a delight. Hi Kate – it’s always refreshing to hear someone is a delight “for real” when I’ve loved her from afar. I was so sad for her. I’m ashamed to say that I didn’t know her music although I had heard her name. It’s always so inspiring to hear of women breaking into all male areas, like rock was at the time. I shall have to go check out her music as I liked that video you posted. That’s so sad that she has Parkinson’s – it’s a terrible thing and as you say, a shame that a talented woman has been silenced by it! Nope, never lived in the US of A. I do know her name though – all said and done though my musical knowledge is appalling. I have to say I’ve never listened to Carla Bruni’s stuff – I found it so embarrassing that our first lady focused her attention and energy on releasing an album and doing cameos in films. There are so many more important and worthwhile things that she could have done with the wealth of resources at her disposal! Is it good by the way? yes, first ladies should do more meaningful things. Ours does a few but she also spends lavishly on vacations for herself and her girlfriends – something no other First Lady has done to such an extravagant extent. It makes me angry because taxpayer money should be used for vets and education. Anyway… i cut Carla some slack because she had a modeling career before she married him ( why the heck did she marry him ?!?). I do like the CD – she has a light, lilting voice and the tunes have a happy feeling to them. “Poor poor pitiful me” is on the playlist playing my car these days. Thanks for some interesting information about an artist I thought I knew. Thanks for stopping by, Dan. I am enjoying the many Boomer memoirs being published – both to learn about their stardom from their perspective, but also to hear their perspective on the turbulent 60s and early 70s. Thank you for your tribute to Linda Ronstadt, without a doubt one of my very favorite singers of all time. I too admire the way she grew and honored her Mexican roots. My personal favorite is probably “Willin'” and her rendition, with Emmy Lou Harris, of “Hank Williams’ I Can’t Help it if I’m Still in Love with You.” Oh, and I also love her version of Chuck Berry’s “Back in the USA” and Woody Guthrie’s “Ramblin’ Round.” I was very sad to hear about the Parkinson’s, but am also glad that she continues to support the music she loves. I’m looking forward to reading her memoir. What a great voice and great memories. Her onset of Parkinsons’ is such a reminder to us to live every day. Did you ever see the Dennis Potter final interview where he talks about the “blossomest blossom”? Well worth watching. Thank you for reading and your info. I have not seen the interview and will look for it online. She IS a blossom!